Gingerbread is as much a part of the holiday experience at Walt Disney World as Christmas trees, peppermint, wreaths, bows, or and bubbly snow. In fact, the spiced molasses treat has been around the parks and resorts for a long, long time. 25 years ago in 1993, the world of gingerbread was expanding and Eyes & Ears’ December 23, 1993 issue provided a complete rundown of what gingerbread (and other sugary) displays you could find throughout the Vacation Kingdom. Surprisingly, there was even more gingerbread to see and smell back than there is to be found in Walt Disney World these days. Let’s take a look at the list. Magic Kingdom Park, Liberty Tree Tavern – a “traditional” gingerbread village, which began five years ago, has been enhanced and added to each season. This year, a country/western flavor brings new excitement, according to Area Chef Marianne Hunnel. EPCOT Center, The Land – a competition between all of the World Showcase pavilions has produced an international village, with chefs through the Park participating. Disney’s Polynesian Resort – an old-fashioned Christmas village, made of gingerbread and candy, is on display on the second floor lobby of this resort. 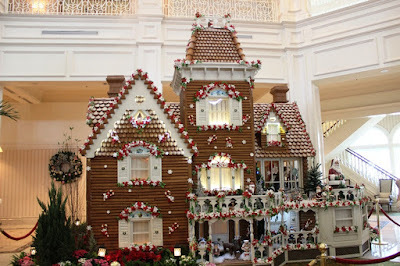 Disney’s Grand Floridian Beach Resort – chefs have constructed an almost life-sized gingerbread playhouse. Again, candy and gingerbread (a lot of it) make up this house near 1900 Park Fare. Disney Contemporary Resort – an “Early American” village made from rock sugar and gingerbread takes a place of prominence at the rear of the first floor lobby. The Disney Inn – a piano and a storyteller add to the “Christmas-y” feel here. Disney’s Fort Wilderness Resort – an “old fashioned” Christmas village is on display at the Trail’s End Buffeteria. Disney’s Caribbean Beach Resort – Caribbean houses made from gingerbread and candy highlight this display. The chefs’ work can be seen in front of each Old Port Royale food shop location. Disney’s Yacht Club Resort – Belle and the Beast are part of this display “in person” and in food product at this main lobby display. Scenes from the movie have been recreated using almond paste, powdered sugar, candy and egg whites. Characters from Beauty and the Beast are on hand during the evening hours it is displayed. Disney’s Beach Club Resort – Ariel stops by the main lobby at night (in person) to meet and greet Guests. The rest of the day, she can be seen here, along with the rest of the cast of Voyage of the Little Mermaid, in an exquisitely crafted diorama of sugar, candy, egg whites and almond paste. Disney’s Port Orleans Resort – scenes from Aladdin highlight this gingerbread, candy sugar and icing creation. “Marketplace” and “Castle” motifs from this smash hit have been recreated in the resort’s lobby. Disney’s Dixie Landing Resort – a “Southern Bayou Christmas” comes to life in the form of gingerbread, icing, candy and sugar at Colonel’s Cotton Mill. Disney Village Marketplace – a gingerbread contest too center stage at Chef Mickey’s Restaurant December 14. Winning entries are on display here and at the Empress Lilly Riverboat. Disney Vacation Club Resort – a Key West Christmas village dominates the front lobby of Olivia’s restaurant. On display until December 29.